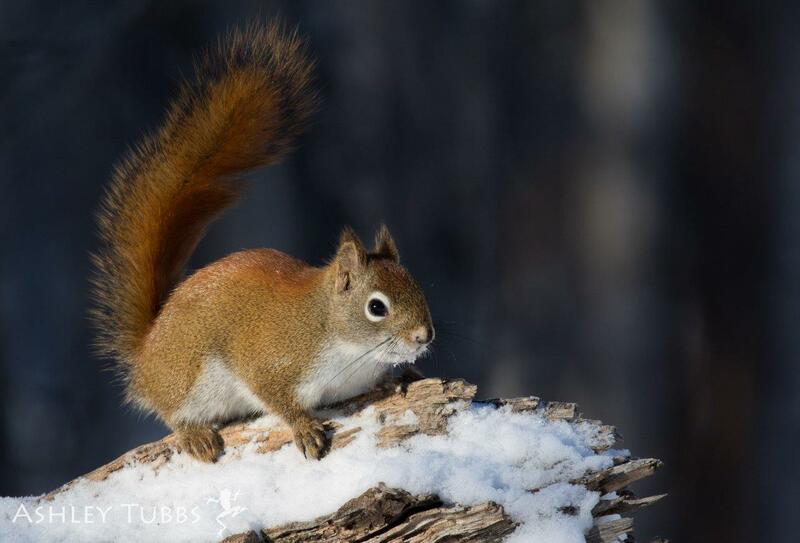 If you have found a wild mammal in need, this page contains helpful information. Some of it is specific to Louisiana, but even if you are somewhere else, you should find the information you need here. PLEASE DO NOT TRY TO REHABILITATE AN INJURED OR ORPHANED WILD ANIMAL WITHOUT A LICENSE AND TRAINING. Not only is that activity illegal, it is dangerous for the human and animal involved. For more info, visit: The Reason You Should Never Feed Injured or Orphaned Wildlife. 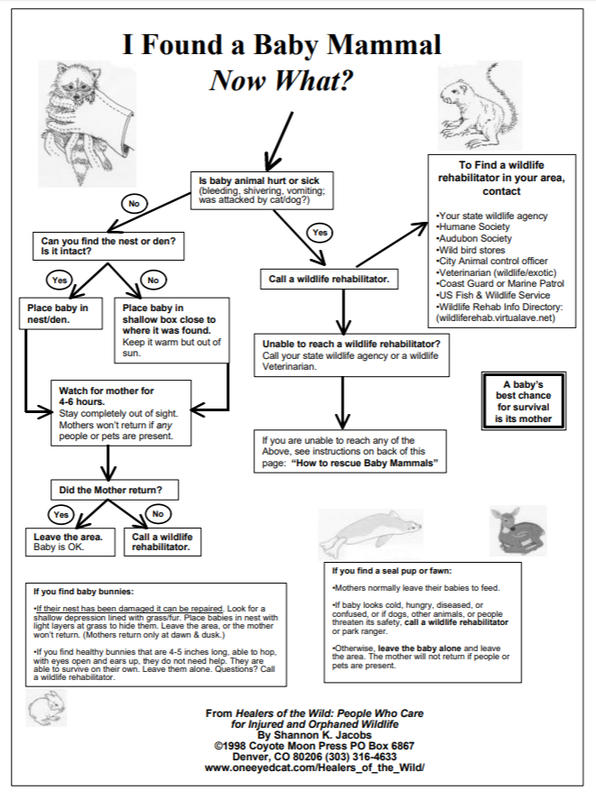 If you have found a baby mammal, click on this image to view a flowchart to determine if the animal is in need of assistance or not, and what you can do to help it. This PDF also has information about how to reunite animals separated from their parents, and how to safely transport, if needed. You may want to read the it even if the animal you found is not an orphan. If you touch a rabies vector species, the animal will need to be euthanized to check for rabies, and you will be advised to seek medical attention. If you run across a skunk, coyote, raccoon, fox, or bat, DO NOT handle the animal. Call a wildlife rehabilitator for advice on what to do. If you do capture or contain the animal, do so in a way that does not expose your skin or clothing to the animal. Even the saliva on the animal's fur is a potential disease vector. Agitation, biting or snapping at imaginary and real objects, and drooling excessively; they may appear tame and have no fear of humans, wobble or circle excessively, appear partially paralyzed or disoriented, and exhibit self-mutilation. Nocturnal species such as skunks may appear in the daytime. Note that the symptoms of distemper or other illnesses may appear similar to the symptoms above, so an animal exhibiting these symptoms may not necessarily have rabies. 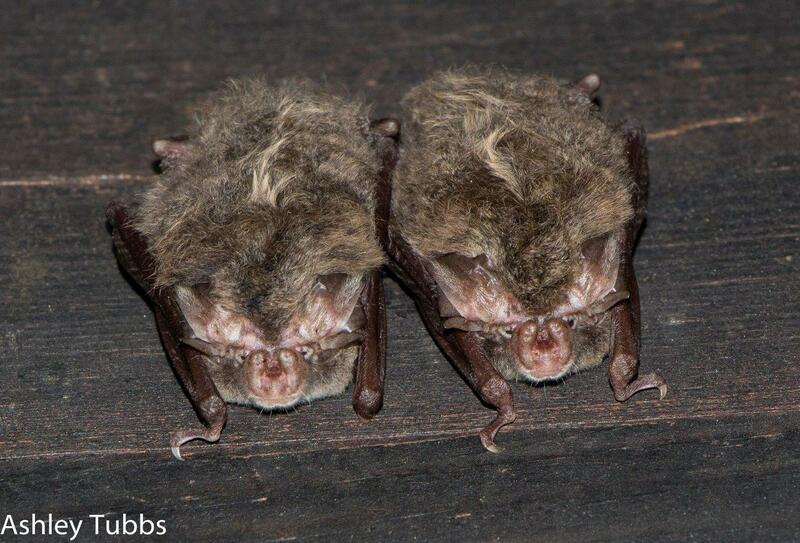 A nocturnal animal such as a bat seen walking around on the ground in the daytime is a sign of distress. Call a wildlife rehabilitator. A baby mammal's best chance of a healthy life is with its mother, so please do not collect the animal unless you have looked at the corresponding flowchart above and followed the instructions. Over half of the calls we get about "orphaned" wildlife are baby animals in a perfectly normal situation that does not require interference. Sometimes an animal needs to be euthanized. This is an emotional task for wildlife professionals and members of the public who are trying to help an animal. If a wildlife professional has advised you that an animal needs to be euthanized, please respect that their decision is based on many factors and do not try to treat it yourself to "avoid it getting killed." You would be doing the animal harm, and potentially exposing yourself to injury, disease and criminal liability. AGAIN, PLEASE DO NOT TRY TO REHABILITATE THE ANIMAL YOURSELF. Not only could you get into a good bit of trouble, there are numerous aspects of wildlife rehabilitation that an untrained person cannot know, such as zoonotic diseases, diet, imprinting, fostering, release site choice and methods, and more. Following the rules is better for you, and it is better for the animal. The licensees are broken down by parish and species served. You should start by calling the closest licensee to you that serves the type of animal you have and work your way outward. Verify on the list that the person listed serves the type of animal you have (birds, mammals, etc.) before calling for best results. L.E.A.R.N. recommends Wildlife Education and Rehabilitation of Louisiana for species in NW Louisiana that L.E.A.R.N. does not serve. WERLA is typically unavailable outside of regular business hours. The best contact method for them is to fill out the form on their site and they will check that as soon as they get a moment and get back with you. Please note that wildlife rehabilitators are not funded by any government agency, but are just concerned individuals trying to assist wildlife, so please consider making a donation. It is illegal to rehabilitate deer, bears, alligators or wild turkeys in Louisiana, and special permission is needed to rehabilitate certain threatened species. Several species of animals, such as foxes and rabbits, get stressed very easily, which can cause further medical complications. Please do not delay getting these (or any) animals treatment. The public is advised to contact your LDWF Field Office to report injured Bald or Golden Eagles. You may also call 1-800-442-2511.